by Chris Woodford. Last updated: March 26, 2019. How can you get more and more out of less and less? The smaller computers get, the more powerful they seem to become: there's more number-crunching ability in a 21st-century cellphone than you'd have found in a room-sized, military computer 50 years ago. Yet, despite such amazing advances, there are still plenty of complex problems that are beyond the reach of even the world's most powerful computers—and there's no guarantee we'll ever be able to tackle them. One problem is that the basic switching and memory units of computers, known as transistors, are now approaching the point where they'll soon be as small as individual atoms. If we want computers that are smaller and more powerful than today's, we'll soon need to do our computing in a radically different way. Entering the realm of atoms opens up powerful new possibilities in the shape of quantum computing, with processors that could work millions of times faster than the ones we use today. Sounds amazing, but the trouble is that quantum computing is hugely more complex than traditional computing and operates in the Alice in Wonderland world of quantum physics, where the "classical," sensible, everyday laws of physics no longer apply. What is quantum computing and how does it work? Let's take a closer look! 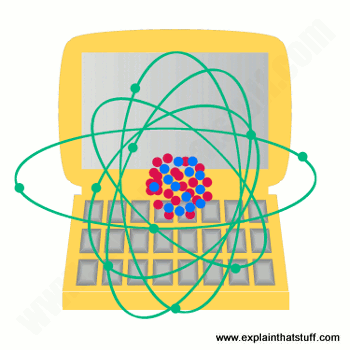 Photo: Quantum computing means storing and processing information using individual atoms, ions, electrons, or photons. On the plus side, this opens up the possibility of faster computers, but the drawback is the greater complexity of designing computers that can operate in the weird world of quantum physics. You probably think of a computer as a neat little gadget that sits on your lap and lets you send emails, shop online, chat to your friends, or play games—but it's much more and much less than that. It's more, because it's a completely general-purpose machine: you can make it do virtually anything you like. It's less, because inside it's little more than an extremely basic calculator, following a prearranged set of instructions called a program. Like the Wizard of Oz, the amazing things you see in front of you conceal some pretty mundane stuff under the covers. Photo: This is what one transistor from a typical radio circuit board looks like. 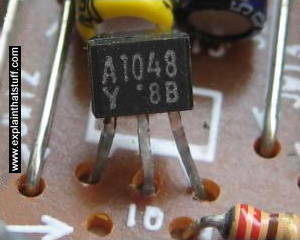 In computers, the transistors are much smaller than this and millions of them are packaged together onto microchips. Conventional computers have two tricks that they do really well: they can store numbers in memory and they can process stored numbers with simple mathematical operations (like add and subtract). They can do more complex things by stringing together the simple operations into a series called an algorithm (multiplying can be done as a series of additions, for example). Both of a computer's key tricks—storage and processing—are accomplished using switches called transistors, which are like microscopic versions of the switches you have on your wall for turning on and off the lights. A transistor can either be on or off, just as a light can either be lit or unlit. If it's on, we can use a transistor to store a number one (1); if it's off, it stores a number zero (0). Long strings of ones and zeros can be used to store any number, letter, or symbol using a code based on binary (so computers store an upper-case letter A as 1000001 and a lower-case one as 01100001). Each of the zeros or ones is called a binary digit (or bit) and, with a string of eight bits, you can store 255 different characters (such as A-Z, a-z, 0-9, and most common symbols). Computers calculate by using circuits called logic gates, which are made from a number of transistors connected together. Logic gates compare patterns of bits, stored in temporary memories called registers, and then turn them into new patterns of bits—and that's the computer equivalent of what our human brains would call addition, subtraction, or multiplication. In physical terms, the algorithm that performs a particular calculation takes the form of an electronic circuit made from a number of logic gates, with the output from one gate feeding in as the input to the next. The trouble with conventional computers is that they depend on conventional transistors. This might not sound like a problem if you go by the amazing progress made in electronics over the last few decades. When the transistor was invented, back in 1947, the switch it replaced (which was called the vacuum tube) was about as big as one of your thumbs. Now, a state-of-the-art microprocessor (single-chip computer) packs hundreds of millions (and up to 30 billion) transistors onto a chip of silicon the size of your fingernail! Chips like these, which are called integrated circuits, are an incredible feat of miniaturization. Back in the 1960s, Intel co-founder Gordon Moore realized that the power of computers doubles roughly 18 months—and it's been doing so ever since. This apparently unshakeable trend is known as Moore's Law. 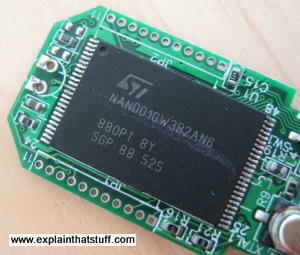 Photo: This memory chip from a typical USB stick contains an integrated circuit that can store 512 megabytes of data. That's roughly 500 million characters (536,870,912 to be exact), each of which needs eight binary digits—so we're talking about 4 billion (4,000 million) transistors in all (4,294,967,296 if you're being picky) packed into an area the size of a postage stamp! It sounds amazing, and it is, but it misses the point. The more information you need to store, the more binary ones and zeros—and transistors—you need to do it. Since most conventional computers can only do one thing at a time, the more complex the problem you want them to solve, the more steps they'll need to take and the longer they'll need to do it. Some computing problems are so complex that they need more computing power and time than any modern machine could reasonably supply; computer scientists call those intractable problems. As Moore's Law advances, so the number of intractable problems diminishes: computers get more powerful and we can do more with them. The trouble is, transistors are just about as small as we can make them: we're getting to the point where the laws of physics seem likely to put a stop to Moore's Law. Unfortunately, there are still hugely difficult computing problems we can't tackle because even the most powerful computers find them intractable. That's one of the reasons why people are now getting interested in quantum computing. If you've studied light, you may already know a bit about quantum theory. You might know that a beam of light sometimes behaves as though it's made up of particles (like a steady stream of cannonballs), and sometimes as though it's waves of energy rippling through space (a bit like waves on the sea). That's called wave-particle duality and it's one of the ideas that comes to us from quantum theory. It's hard to grasp that something can be two things at once—a particle and a wave—because it's totally alien to our everyday experience: a car is not simultaneously a bicycle and a bus. In quantum theory, however, that's just the kind of crazy thing that can happen. The most striking example of this is the baffling riddle known as Schrödinger's cat. Briefly, in the weird world of quantum theory, we can imagine a situation where something like a cat could be alive and dead at the same time! What does all this have to do with computers? Suppose we keep on pushing Moore's Law—keep on making transistors smaller until they get to the point where they obey not the ordinary laws of physics (like old-style transistors) but the more bizarre laws of quantum mechanics. The question is whether computers designed this way can do things our conventional computers can't. If we can predict mathematically that they might be able to, can we actually make them work like that in practice? People have been asking those questions for several decades. Among the first were IBM research physicists Rolf Landauer and Charles H. Bennett. Landauer opened the door for quantum computing in the 1960s when he proposed that information is a physical entity that could be manipulated according to the laws of physics. One important consequence of this is that computers waste energy manipulating the bits inside them (which is partly why computers use so much energy and get so hot, even though they appear to be doing not very much at all). In the 1970s, building on Landauer's work, Bennett showed how a computer could circumvent this problem by working in a "reversible" way, implying that a quantum computer could carry out massively complex computations without using massive amounts of energy. In 1981, physicist Paul Benioff from Argonne National Laboratory tried to envisage a basic machine that would work in a similar way to an ordinary computer but according to the principles of quantum physics. The following year, Richard Feynman sketched out roughly how a machine using quantum principles could carry out basic computations. A few years later, Oxford University's David Deutsch (one of the leading lights in quantum computing) outlined the theoretical basis of a quantum computer in more detail. How did these great scientists imagine that quantum computers might work? The key features of an ordinary computer—bits, registers, logic gates, algorithms, and so on—have analogous features in a quantum computer. Instead of bits, a quantum computer has quantum bits or qubits, which work in a particularly intriguing way. Where a bit can store either a zero or a 1, a qubit can store a zero, a one, both zero and one, or an infinite number of values in between—and be in multiple states (store multiple values) at the same time! If that sounds confusing, think back to light being a particle and a wave at the same time, Schrödinger's cat being alive and dead, or a car being a bicycle and a bus. A gentler way to think of the numbers qubits store is through the physics concept of superposition (where two waves add to make a third one that contains both of the originals). If you blow on something like a flute, the pipe fills up with a standing wave: a wave made up of a fundamental frequency (the basic note you're playing) and lots of overtones or harmonics (higher-frequency multiples of the fundamental). The wave inside the pipe contains all these waves simultaneously: they're added together to make a combined wave that includes them all. Qubits use superposition to represent multiple states (multiple numeric values) simultaneously in a similar way. Just as a quantum computer can store multiple numbers at once, so it can process them simultaneously. Instead of working in serial (doing a series of things one at a time in a sequence), it can work in parallel (doing multiple things at the same time). Only when you try to find out what state it's actually in at any given moment (by measuring it, in other words) does it "collapse" into one of its possible states—and that gives you the answer to your problem. Estimates suggest a quantum computer's ability to work in parallel would make it millions of times faster than any conventional computer... if only we could build it! So how would we do that? What would a quantum computer be like in reality? In reality, qubits would have to be stored by atoms, ions (atoms with too many or too few electrons), or even smaller things such as electrons and photons (energy packets), so a quantum computer would be almost like a table-top version of the kind of particle physics experiments they do at Fermilab or CERN. Now you wouldn't be racing particles round giant loops and smashing them together, but you would need mechanisms for containing atoms, ions, or subatomic particles, for putting them into certain states (so you can store information), knocking them into other states (so you can make them process information), and figuring out what their states are after particular operations have been performed. Photo: A single atom or ion can be trapped in an optical cavity—the space between mirrors—and controlled by precise pulses from laser beams. 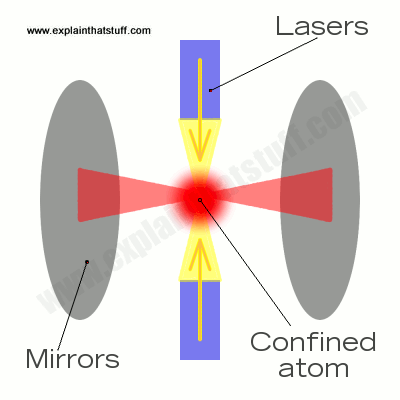 In practice, there are lots of possible ways of containing atoms and changing their states using laser beams, electromagnetic fields, radio waves, and an assortment of other techniques. One method is to make qubits using quantum dots, which are nanoscopically tiny particles of semiconductors inside which individual charge carriers, electrons and holes (missing electrons), can be controlled. Another method makes qubits from what are called ion traps: you add or take away electrons from an atom to make an ion, hold it steady in a kind of laser spotlight (so it's locked in place like a nanoscopic rabbit dancing in a very bright headlight), and then flip it into different states with laser pulses. In another technique, the qubits are photons inside optical cavities (spaces between extremely tiny mirrors). Don't worry if you don't understand; not many people do. Since the entire field of quantum computing is still largely abstract and theoretical, the only thing we really need to know is that qubits are stored by atoms or other quantum-scale particles that can exist in different states and be switched between them. What can quantum computers do that ordinary computers can't? Does that mean quantum computers are better than conventional ones? Not exactly. Apart from Shor's algorithm, and a search method called Grover's algorithm, hardly any other algorithms have been discovered that would be better performed by quantum methods. Given enough time and computing power, conventional computers should still be able to solve any problem that quantum computers could solve, eventually. In other words, it remains to be proven that quantum computers are generally superior to conventional ones, especially given the difficulties of actually building them. Who knows how conventional computers might advance in the next 50 years, potentially making the idea of quantum computers irrelevant—and even absurd. Photo: Quantum dots are probably best known as colorful nanoscale crystals, but they can also be used as qubits in quantum computers). 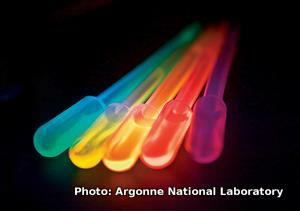 Photo courtesy of Argonne National Laboratory. Why is it so hard to make a quantum computer? We have decades of experience building ordinary, transistor-based computers with conventional architectures; building quantum machines means reinventing the whole idea of a computer from the bottom up. First, there are the practical difficulties of making qubits, controlling them very precisely, and having enough of them to do really useful things. Next, there's a major difficulty with errors inherent in a quantum system—"noise" as this is technically called—which seriously compromises any calculations a quantum computer might make. There are ways around this ("quantum error correction"), but they introduce a great deal more complexity. There's also the fundamental issue of how you get data in and out of a quantum computer, which is, itself, a complex computing problem. Some critics believe these issues are insurmountable; others acknowledge the problems but argue the mission is too important to abandon. How far off are quantum computers? Three decades after they were first proposed, quantum computers remain largely theoretical. Even so, there's been some encouraging progress toward realizing a quantum machine. There were two impressive breakthroughs in 2000. First, Isaac Chuang (now an MIT professor, but then working at IBM's Almaden Research Center) used five fluorine atoms to make a crude, five-qubit quantum computer. The same year, researchers at Los Alamos National Laboratory figured out how to make a seven-qubit machine using a drop of liquid. Five years later, researchers at the University of Innsbruck added an extra qubit and produced the first quantum computer that could manipulate a qubyte (eight qubits). These were tentative but important first steps. Over the next few years, researchers announced more ambitious experiments, adding progressively greater numbers of qubits. By 2011, a pioneering Canadian company called D-Wave Systems announced in Nature that it had produced a 128-qubit machine; the announcement proved highly controversial and there was a lot of debate over whether the company's machines had really demonstrated quantum behavior. Three years later, Google announced that it was hiring a team of academics (including University of California at Santa Barbara physicist John Martinis) to develop its own quantum computers based on D-Wave's approach. In March 2015, the Google team announced they were "a step closer to quantum computation," having developed a new way for qubits to detect and protect against errors. In 2016, MIT's Isaac Chuang and scientists from the University of Innsbruck unveiled a five-qubit, ion-trap quantum computer that could calculate the factors of 15; one day, a scaled-up version of this machine might evolve into the long-promised, fully fledged encryption buster. There's no doubt that these are hugely important advances. and the signs are growing steadily more encouraging that quantum technology will eventually deliver a computing revolution. In December 2017, Microsoft unveiled a complete quantum development kit, including a new computer language, Q#, developed specifically for quantum applications. In early 2018, D-wave announced plans to start rolling out quantum power to a cloud computing platform. A few weeks later, Google announced Bristlecone, a quantum processor based on a 72-qubit array, that might, one day, form the cornerstone of a quantum computer that could tackle real-world problems. All very exciting! Even so, it's early days for the whole field, and most researchers agree that we're unlikely to see practical quantum computers appearing for some years—and more likely several decades. The conclusion reached by an influential National Academies of Sciences, Medicine and Engineering report in December 2018 was that "it is still too early to be able to predict the time horizon for a practical quantum computer" and that "many technical challenges remain to be resolved before we reach this milestone." Six Easy Pieces by Richard Feynman. Basic Books, 2011. Chapter 6 is a short and very concise introduction, focusing on the famous double-slit experiment that confirms things can be particles and waves at the same time. Mr Tompkins in Paperback by George Gamov. Cambridge University Press, 1993. A modern reissue of the classic introduction to quantum theory from one of its 20th-century pioneers. In Search of Schrödinger's Cat by John Gribbin. Black Swan, 2012. An updated edition of the classic introduction to quantum ideas. The Quantum Age: How The Physics Of The Very Small Has Transformed Our Lives by Brian Clegg. Icon, 2015. An accessible introduction that shows how the science of quantum theory leads to practical applications, including a brief overview of quantum computing in Chapter 11. Computing with Quantum Cats by John Gribbin. Black Swan, 2015. A readable overview that puts quantum computing in a bigger, broader, historical context. The Fabric of Reality by David Deutsch. Penguin, 2011. From one of the pioneers of quantum computing, a look at the broad implications of quantum theory, including a couple of chapters (6 and 9) that address quantum computing. A Shortcut Through Time: The Path to the Quantum Computer by George Johnson. Random House, 2004. An easy-to-follow, popular-science-style guide covering the basics of quantum computing (similar in scope to this article but in much more detail). Also covers related fields such as quantum cryptography. This is the best place to start for an absolute beginner who doesn't want to get bogged down in math. Quantum Computing: Progress and Prospects (2018): A report by the National Academies of Sciences, Engineering, and Medicine. The National Academies Press, 2018. Don't expect to see quantum machines in a store near you any time soon: "Significant technical advances will be required before a large-scale, practical quantum computer can be achieved." Quantum Computation and Quantum Information by Michael A. Nielsen and Isaac L. Chuang. Cambridge University Press, 2011. The definitive academic textbook by two quantum computing pioneers. An Optimist's View of the 4 Challenges to Quantum Computing by Jim Clarke. IEEE Spectrum, March 22, 2019. The promise of quantum computers is too great to abandon the effort in the face of technical challenges, argues Intel's director of quantum hardware. The Case Against Quantum Computing by Mikhail Dyakonov. IEEE Spectrum, November 15, 2018. The gap between quantum-computing experiments and practical machines "is not likely to be closed anytime soon", argues a theoretical physicist. IBM Simulates a 56-Qubit Machine by Charles Q. Choi. IEEE Spectrum, October 30, 2017. IBM has used a conventional supercomputer to test a model of a 56-Qubit quantum computer. Bill Gates admits quantum computing leaves him baffled by Sarah Salinas. CNBC, September 25, 2017. Bill Gates and Satya Nadella think quantum computing is the future, even while they struggle to understand how it works. Google Plans to Demonstrate the Supremacy of Quantum Computing by Rachel Courtland. IEEE Spectrum, May 24, 2017. Google's next target is a 49-qubit quantum computer. Scientists are close to building a quantum computer that can beat a conventional one by Gabriel Popkin. Science, December 1, 2016. Who will win the race to build a practical quantum machine? This is a great survey of recent progress. Google's Quantum Dream Machine by Tom Simonite. MIT Technology Review. December 18, 2015. Can physicist John Martinis help Google deliver the "holy grail" of quantum computing? Researchers Report Milestone in Developing Quantum Computer by John Markoff. The New York Times. March 4, 2015. Google's research team reports progress on error correction in quantum computing. The Man Who Will Build Google's Elusive Quantum Computer by Klint Finley. Wired. September 5, 2014. A look at the quantum research of John Martinis. How D-Wave Built Quantum Computing Hardware for the Next Generation by Jeremy Hsu. IEEE Spectrum, July 11, 2014. An update on quantum computing progress at D-Wave. Dream Machine: The mind-expanding world of quantum computing by Rivka Galchen. The New Yorker, May 2, 2011, p.34. An introduction to the work of David Deutsch on quantum computing. The Fundamental Limits of Computation by Charles H. Bennett and Rolf Landauer, Scientific American, July 1985. Introduces the concept of reversible computation and then explains how quantum computers could work in a reversible way. These sites are useful if you want a glimpse at cutting-edge quantum research. Some have good educational resources and simulations you can play about with.